He looks at the distance to the bottom and at the wall in front of him, visibly making mental calculations. He walks back to the low-standing wall behind him and prepares himself for the jump. He leans forward on the balls of his feet, makes a run for the wall, every part of him poised for a leap. In the blink of an eye, Dyllon Davidson shoots into the air, and ends up clinging onto the wall by the Wartenweiller Library, no suction gloves in sight, just his calloused hands grasping at the rough-surfaced wall. Students watch and gasp in awe at the Spiderman-like display. 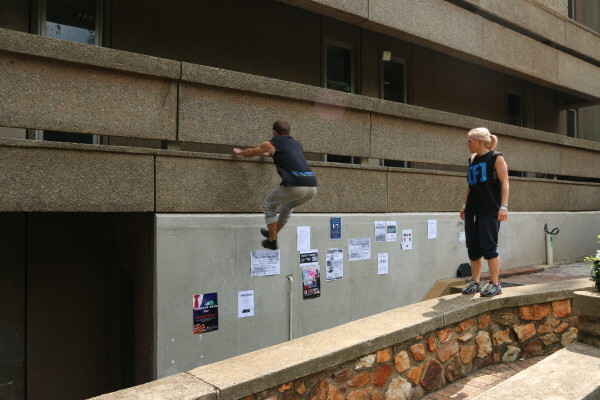 Most of us walk around Wits university’s main campus only seeing the buildings for what they are, cold concrete, but there is a group of people who see these buildings and its surroundings as a playground, a concrete jungle-gym of sorts. These people are Parkour practitioners. Parkour is a form of training that was developed in the 1980s in France. The sport involves flips, vaulting, jumping, swinging and other movements to get from one spot to another. Parkour is about training the human body to be able to overcome any obstacle that it comes across, a survival mentality and freerunning is about moving efficiently while doing it in an expressive way. “They are both examples of the two sides of the coin of movement, because we move to get from a to b or we move to express ourselves,” says Davidson, co-founder and trainer of Concrete Foundation Crew. Even the stunts you see in movies are put together by parkour athletes such as Davidson, who has worked with a number of movies in the past couple of years, namely, Resident Evil, Mad Max and The Avengers, to name a few. Davidson says Wits University has been one of, if not the only, university in South Africa to be supportive of the sport by allowing athletes onto its campus to train and “jam”.